LearnScience.Academy is a guide to the rich resources available for the homeschooling community at Conceptual Academy, which offers full credit courses based upon the popular “conceptual” line of science textbooks and the author’s library of 600+ engaging video lessons. 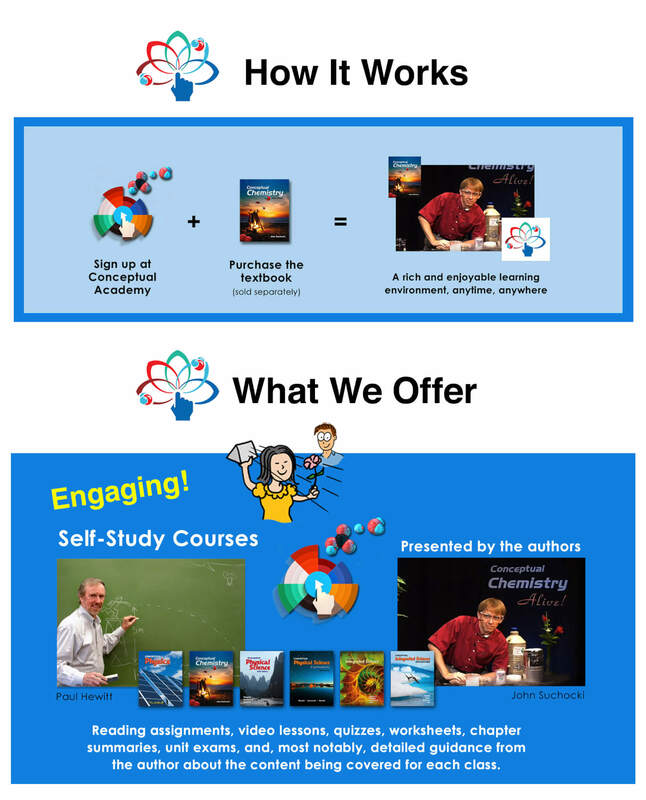 Each Conceptual Academy course also provides study advice from the authors, worksheets, chapter summaries, automated quizzes, our new automated “encouragement-based” homework system, a grade book, unit exams, and lab manuals that focus on meaningful activities accomplished with materials readily available in your home or a local discount store. The works! These courses are top-notch and ready-to-roll. Learn more by exploring this site, which is Conceptual Academy’s support site especially for home schools. 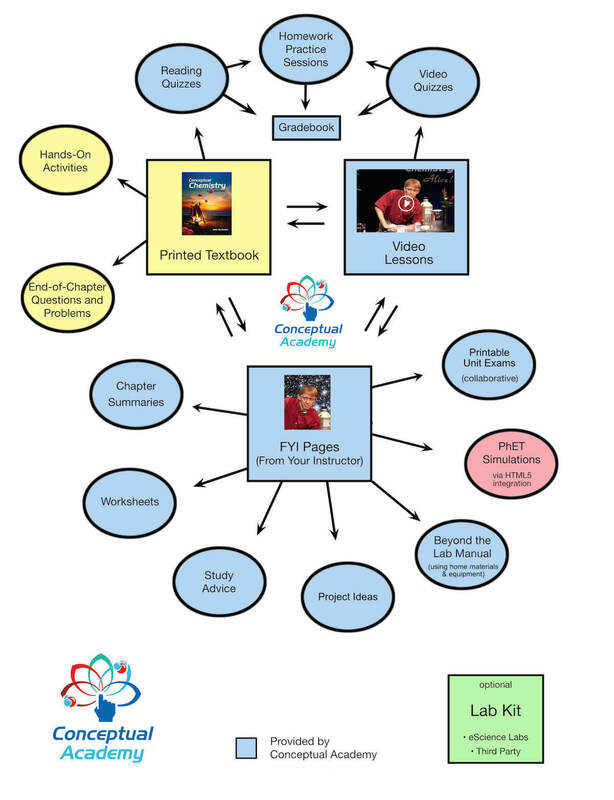 Scroll downward for a quick overview of what Conceptual Academy has to offer. Open the “Music Video Montage” in the sidebar to get a sense of the author’s excitement for teaching. To learn more about our courses, follow the “Course Descriptions” sidebar menu. Thank you for visiting LearnScience.Academy where you will find welcomed relief from any confusion you might have on how to bring all the information available on science so that it’s organized, fun, and easily accessible. If you would love to have a well-versed instructor provide your student with solid instruction so you can concentrate on the playful aspects of teaching, such as activities, experiments, and field trips, then you have come to the right place. Each Conceptual Academy course is designed around one of our market-leading textbooks and includes a library of our video lessons that you will find to be immediately accessible to your student in an engaging way. The best way to understand how an actual course works is to take a look at our free sample course page. The best way to get a sense of how much fun our courses are for the learner is to sit back and watch our music video montage shown in the side bar. But please keep this in mind, the joy your student finds is not really from us. Rather the joy arises naturally from learning science for what it is: a window of understanding into this amazing universe in which we are all so fortunate to be alive. We authors are just your experienced tour guides. If you’re like most homeschooling parents who have come across our curriculum, one of the first questions you will be asking is not whether, but WHICH course your student should be taking first. For this and other immediate questions you’ll likely have, please visit our FAQ page. We are very pleased you too have found us here at LearnScience.Academy. It’s here at this site you will learn all about the rich resources available to you through our learning and content management system known as Conceptual Academy. We look forward to your joining our community of learners. Here is one of our video lessons on eclipses. Enjoy! Sign up for our cool “mini-experiments” newsletter. These aren’t just random activities. Rather, they are sure to be a source of lively dinner conversations and a great way to learn about the quality of our educational content. Click on the above flow chart to review the resources available within each of our courses. Your book is truly the best one I have found to promote an interest in what I call “chemistry for life” for students who are not necessarily pursuing a science major in college. The other books/curriculum I have looked at are usually written in a dry and uninteresting manner and also focus heavily on the math! While this is adequate for the very academic learners and those wanting to pursue an education in the sciences, it usually makes the majority of the students hate chemistry (except if the teacher can make it “come alive”). I just can’t quite bring myself to use one of those books again. Thanks for making the world of chemistry interesting and approachable.